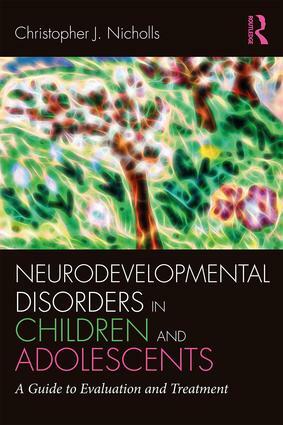 Neurodevelopmental Disorders in Children and Adolescents provides an innovative perspective on developmental disorders in youth, one focused on embracing and working with the "messiness" and many variables at play in child and adolescent development. The volume’s approach is aligned with the NIMH Research Domain Criteria project, which hopes to move away from categorical diagnosis toward multidimensional analysis. Each chapter focuses on a particular aspect of development, cluster of diagnoses, or clinical concern. The book also emphasizes humility, an awareness of diversity and difference without stigma, and support for collaborative and integrative healthcare. This is an essential volume for practitioners hoping to improve how they evaluate and treat developmental disorders in children. "In this charming, comprehensive, and warmly written book, Chris Nicholls invites us to set aside categorical thinking and allow ourselves to see the child, their family, and their unique life contexts in all their messy splendor. Are we considering variance in a child’s test data or history to reflect interesting considerations or annoying facts that don’t fit our diagnostic impression? At every turn of the page, Dr. Nicholls resists the ‘wishful desire for a nice, simple explanation for just how complicated life is.’ Reading this book is like having the great good fortune to be personally mentored by the type of seasoned, collaborative, highly knowledgeable professional you would bring your own child to see." "Dr. Nicholls has provided the neuropsychological community with an outstanding model for applying a developmental approach to dimensional analysis of disorders in children and adolescents. If I were training graduate students and postdoctoral residents, Dr. Nicholls's work would definitely be on our reading list. For practicing clinicians, this volume will broaden conceptualization of neuropsychological interpretation, add significantly to a knowledge base, and reinforce the integration of information from a variety of sources into a sophisticated understanding of the individual, leading to pragmatic recommendations for implementing strategies to make a meaningful difference for the individual." "Dr. Nicholls’s clinical experience and expertise is evident in this unique volume, which addresses conceptual and practical issues when working with children and adolescents with neurodevelopmental disorders. I believe the book will be thought provoking for beginning and experienced practitioners." Christopher J. Nicholls, PhD, ABPP, ABPdN, is a clinical neuropsychologist with more than 35 years of experience working in medical centers, teaching hospitals, and private practice, specializing in neurodevelopmental disorders. He is a Fellow of the National Academy of Neuropsychology, the American Academy of Pediatric Neuropsychology, and the American Academy of Clinical Psychology. Much of the available information relevant to mental health clinicians is buried in large and disjointed academic textbooks and expensive and obscure scientific journals. Consequently, it can be challenging for the clinician and student to access the most useful information related to practice. Clinical Topics in Psychology and Psychiatry includes authored and edited books that identify and distill the most relevant information for practitioners and presents the material in an easily accessible format that appeals to the psychology and psychiatry student, intern or resident, early career psychologist or psychiatrist, and the busy clinician.